“Whether you’re an RV enthusiast, a dedicated tent camper or a day user, this useful book offers comprehensive and practical information that will make for for a more enjoyable beach vacation. 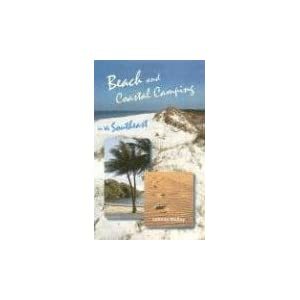 Filled with pictures and practical tips, this user-friendly paperback guidebook offers down-to-earth, detailed advice about the 42 best Atlantic Ocean- and Gulf of Mexico camping areas in the Southeast for both tent and RV campers. From the shores of Maryland, down to the Outer Banks, and south to the Florida Keys,, up the Gulf, and over to the long coast of Texas Molloy selected these state and national parks for their scenic beauty, recreation potential, and proximity to the Atlantic Ocean or the Gulf of Mexico. His list includes everything from ultra-rustic to highly developed sites, all compactly organized by geographic region. · essentials of how to make reservations and get there, including phone numbers, driving directions, size of campsite, facilities, regulations, and more. For visitors and residents, retirees, college students, and families with children, this book will simplify the coastal camping experience. Johnny Molloy has done the research and provided the best selections from thousands of miles of coastline in the Southeast. Padre Island National Seashore is a land, well, island, of superlatives. For starters, this Texas coastal gem lays claim to being the world’s longest barrier island. A staggering 113 miles from end to end, it used to be even longer before the Mansfield Channel, which now marks the islands southern terminus, was cut as a shipping lane in 1964. The national seashore portion of Padre Island extends for 80 miles and ends at Mansfield Channel. And the entire Gulf frontage of the protected national seashore is beach! Here, the Gulf crashes into a wide sandy swath backed by high dunes that reach well back from the coastline. Most of the island remains in a natural state and is accessible only by four-wheel drive vehicles. However, the park has some infrastructure, including a campground, visitor center, day use beaches that make it accessible and enjoyable by all, including those with ordinary passenger cars or a big RV. At most beach destinations, pockets of natural beach are surrounded by civilization. Here on Padre Island, a few pocket of development are surrounded by nothing but nature. You will notice that driving into the national park. The coastal prairie has rolling, vegetation-covered dunes broken by ponds. The crash of the ocean is never far away. Padre Island has so many dunes, you may be tempted to call it Texas Hill Country By the Gulf. From north to south, the first beach access on Padre Island is North Beach. Then you reach Malequite Beach, which is the primary park development and recreation area. Malequite Beach Campground is on the Gulf side of the dunes. Just to the south is the park visitor center, with its ample facilities. The primary beach access is at the park visitor center. Here is a bathhouse, a shaded picnic area, small grocery, cold showers, informative displays and an observation deck. A walkway leads to the Gulf, where three miles of beachfront are closed to vehicles. Large dunes back the wide beach here. Shaded beachfront picnic cabanas are claimed quickly. No cars are allowed on this stretch of sand. South Beach is south of Malequite Beach. Here is an auto beach access, and where all manner of vehicles drive and camp on the beach for the first four miles. Four-wheel drive vehicles only are recommended south of the four mile mark. Intrepid and well prepared explorers can travel the entire 60 miles of southward beach to Mansfield Channel. Padre Island has many types of camping, from primitive beach camping with no facilities to the organized and designated Malequite Beach Campground. A road breaks through the dunes to reach Malequite Beach. The 42-unit campground is stretched lengthwise along the water with commanding beach and Gulf views. The campsites are situated a bit close together. Dunes back the camping area. The sites closest to the beach are the best, as the sites away from the beach are small and mostly pavement. At each end of the camping area are four tent campsites that have shade cabanas at them. A beach access leads down to the water. Bigger RVs may have trouble pulling into the pull-ins if the campground is crowded. A campground host keeps things safe and organized. Malequite Beach Campground rarely fills, save for spring break. The reason for this is because there are so many other camping opportunities at Padre Island. For starters, Bird Island Basin offers campers a chance to overnight on Laguna Madre, the bay side of Padre Island. Camping is a bit of a free-for-all here, with no designated sites, but the area does have some vault toilets. Yarbrough Pass Campground is accessible only by four wheel drive vehicle and is also on Laguna Madre. However, Padre Island is probably best known for its primitive beach camping. A beach access road is located just south of the Visitor Center. Here, visitors can drive right onto the sand. The first four miles of beach is accessible by all vehicles including RVs! Yes, you will see RVs driving on the beach. Four-wheel drive vehicles are needed beyond the four mile mark and you can camp anywhere along the beach for 60 miles all the way to Mansfield Channel! Solitude seekers will have no problem here. Free permits are required for primitive beach camping. The Karankawa Indians, whose height, propensity to tattoo their faces and somewhat erroneous reputation as cannibals painted them as a fierce tribe to be defeated by European settlers, first inhabited Padre Island. They were quickly eliminated from the Texas coast via disease, warfare and inability to adapt to Western ways. Later, Spaniards visited the island but left it to nature until Father Jose Nicolas Balli founded a mission and ranch on the island in the early 1800s. Its early name of White Island faded with time and the mission led to the new name of Padre Island. Padre Balli hired out help for the ranch and never actually lived here, though his nephew continued operations until his death in the 1850s. The relentless winds, storms and hurricanes eventually buried the ranch at Padre Island. However, the name Padre Island stuck. Padre Island is a natural Gulf experience at its best. The wide, dune backed beaches are the main draw. Folks can enjoy beachfront with or without their vehicles. Swimming, beachcombing, surf fishing are the primary activities on the Gulf. Secondary park activities are birding, wind surfing and kayaking. The entire park is open to birding and the many habitats offer changing birding experiences. Up to 350 species of birds visit or call Padre Island home during the year. Fall and winter are the best times to bird here. The calmer waters of Bird Basin are popular with those who want to enjoy the recreation opportunities of Laguna Madre. The park’s only boat ramp is here. The waters of the bay are usually enjoyed by anglers, who carefully boat the shallows in search of redfish, sea trout, pompano, jack crevalle and catfish. Surf fishing on the Gulf side yields many of the same species. Big Shell Beach is purportedly the best surf fishing locale in the park. Windsurfing is popular in Laguna Madre, as is kayaking. A seasonal kayak rental facility is located on Laguna Madre at Bird Basin. Thos who want to learn more about the national seashore can enjoy some of the daily interpretive programs, walks and films about such topics as Gulf turtles, shoreline life, dune formation and also island birds. The town of Corpus Christi is within easy striking distance of Padre Island. The town offers a full complement of restaurants and other major city facilities. The Corpus Christi Museum of Science and History is a worthy endeavor. The USS Lexington, also known as the “Blue Ghost,” is a retired navy battleship that survived the attack on Pearl Harbor of December 7, 1941. You can tour the ship, and see artifacts from not only this ship but also the USS Arizona, which was sunk during the day “that shall live in infamy” as FDR put it. Visit the Texas State Aquarium that features freshwater and saltwater life that as a beach camper you will surely enjoy. Directions: From Corpus Christi, take TX 358 east until it becomes Park Road 22. Keep forward on Park Road 22 and follow it across Laguna Madre onto Padre Island and continue south to enter the park.